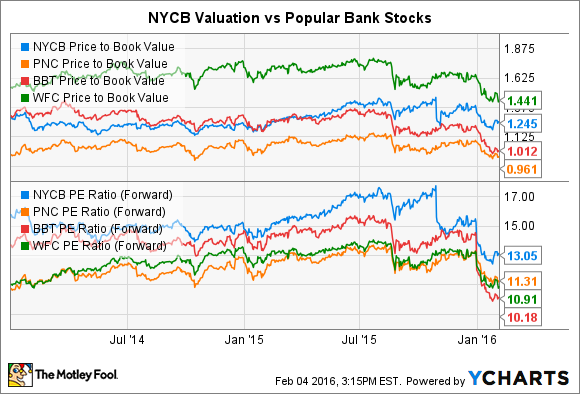 Is Now the Time to Buy New York Community Bancorp? Could a major dividend cut be looming? And does that even matter over the long term? Over the last three months, New York Community Bancorp's (NYSE:NYCB) stock has been hammered. Here's why, what it means, and my views on whether now is the right time to buy. For years, New York Community Bancorp has intentionally kept its total assets below the key regulatory threshold at $50 billion, waiting to find a suitable acquisition target to leap frog that threshold, and propel the bank into the heightened regulatory landscape. During this wait-and-see period, the bank has been paying out a huge percentage of its income -- 89% from 2010 to 2014 -- as dividends. Those incredible payouts resulted in exceptional yields, making New York Community a favorite of bank investors everywhere. On October 29 of last year, though, the bank announced an agreement to acquire Astoria Financial Corporation (NYSE:AF). The bank had found its ticket into the world of $50+ billion banks and the Federal Reserve's annual comprehensive capital analysis and review process, or CCAR. In other words, as a $50+ billion bank, the Fed will now have a say in how much New York Community Bancorp can pay out in dividends, and it looks like a major dividend cut may be coming. The prospect of a dividend cut has sent many dividend investors running. However, for long-term investors, I think this change is not nearly the bad news the market would have you believe. At the time of this writing, New York Community Bancorp's dividend yields 4.4%. If that is cut by two thirds -- quite an aggressive decline -- it would still yield 2.9%. That's more than the S&P 500 average of 2.27%, more than PNC Financial Services' (NYSE: PNC) 2.37%, slightly less than Wells Fargo's (NYSE: WFC) 2.99%, and still competitive with BB&T's (NYSE: BBT) 3.31%. New York Community may not be a go-to dividend stock going forward, but it will still have an attractive yield in line with, or better than, many other options. One-time expenses related to the Astoria acquisition and a debt restructuring caused New York Community's fourth quarter to end the year on a somewhat ugly note. However, excluding those non-recurring expenses and looking at the company's real operating performance reveals a very strong quarter and year. For example, the company originated $3.7 billion in loans to be held on its balance sheet in the quarter, driving the annual total to $12.7 billion in loan production, records on both a quarterly and annual basis. Excluding one-time expenses, the company returned 1.18% on assets and 9.98% on equity in the quarter. The bank's efficiency ratio -- a measure of the costs it takes to produce revenue -- remained quite strong at 41%, again excluding for the one-time merger-related costs. A lower efficiency ratio indicates better efficiency, and NYCB has a solid lead even over industry-powerhouse Wells Fargo. In terms of valuation, the market is attempting to price in the changing dynamic in the company's dividend, while also taking into account New York Community's strong fundamentals. On a forward basis, the bank's price-to-earnings ratio continues to command a premium over other popular bank stocks, even with the declines since November. On a price-to-book value basis, the stock doesn't look quite as expensive, but still commands a premium price relative to most regional bank valuations. NYCB Price to Book Value data by YCharts. What could go wrong, long term? If the company's fundamentals are strong today, is there a major problem lurking just around the corner? Maybe; but so far, I remain confident that management is on top of the situation. New York Community Bancorp is a bank built on loans supported by rent-controlled multi-family apartment buildings in New York City. Those buildings tend to have exceptional occupancy rates, making their cash flow stable, and keeping New York Community's loan losses low in both good and bad economic times. With the acquisition of Astoria and the shift into growth mode, the biggest long-term risk I see for New York Community Bancorp is a deterioration in their credit quality. So the important thing for us is that we're very consistent in our business model...We in fact are very, very consistent with how we lend, and our exposure to our markets in the best of times and in the worst of times is consistently better than that of our peers, as well as those that are not necessarily very prudent about how they lend in New York. Even with the Astoria acquisition and the tactical shift back to growth, the bank's management appears to remain committed to what's made the bank so successful in the past. The risk is still there, but so far, management is saying and doing the right things. New York Community Bancorp is down more than 20% from its high preceding the announcement of the merger with Astoria Financial. That's a major drop for a bank with excellent fundamentals and an attractive dividend, even considering possible cuts. With a price-to-book value hovering around 1.25 times, the bank looks to be fairly priced, in my view. The acquisition of Astoria marks the beginning of a time of change for the bank, and I think short-term market movements are overlooking the long-term potential for this stock. To me, New York Community Bancorp is an attractive long-term buying opportunity at today's price, and I think any further market declines will present even better buying opportunities. Over the short and medium term, however, I think the market will take a cautiously negative stance on the stock, waiting to see how the company will manage the increased regulatory burden, and how the dividend will fair under the Fed's microscope.